Even though we're in the middle of moving, I've already set aside my non-Asmodee games, because I need to be ready. I'm still puzzling how to demo Eclipse quickly. It's not a game designed for a fast demo - and, with the third printing due in October (and the second printing already sold out nearly everywhere), I do expect a lot of requests for demos of this one. Seasons will also be big. And the designer will be in the booth this year. I hope that Libertalia will also do very well. I have that "good con" vibe this year. 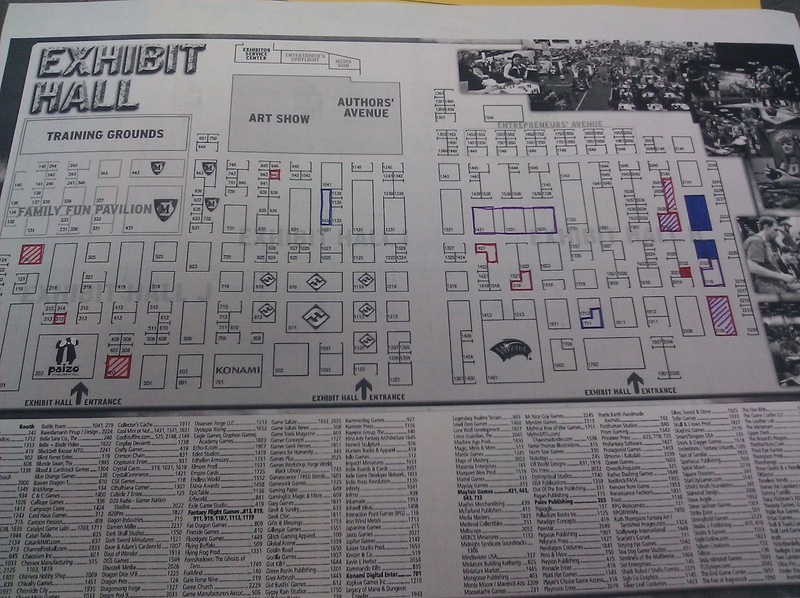 Not that there is a such a thing as a bad GenCon, mind you. But some are better than others. We will apparently have most of last year's team back with us, which is good. We had a solid team that bonded well (and - more importantly - worked well together). 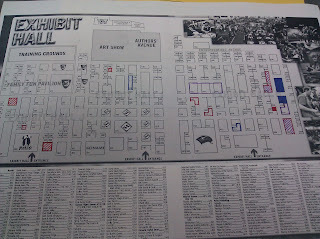 Within a day of the Exhibit Hall Map being released, I was already marking it up. We, by the way, are the solid blue spaces to the right of this image. If you're trying to make sense of my color coding, it's easier than it looks. In order of Safe to Dangerous, it goes Blue -> Purple -> Red. Most of the blues are "I wonder if they have anything new or that I might want to spend money on this year." The purple borders are, "I know they have a game or two which I both lack and desire." The red borders with purple stripes are, "They will probably beat me up and take all of my money." The red with red stripes are "Leave the wallet in the booth before visiting." And the solid red one? That's the single booth which has consistently sucked the most money out of our pockets. IPR. Even my wife isn't safe from that booth. Either way, we have just over a month to go.